Ninety two year old P. K. Page has written in almost every genre possible, including poetry, fiction, memoirs, libretto and children’s fiction. 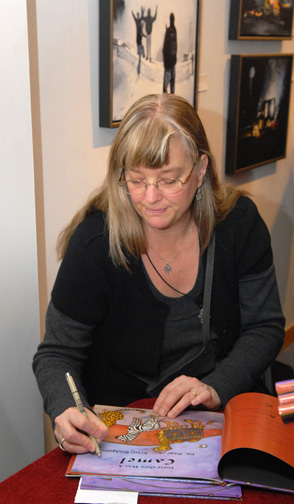 Her latest book, created with noted illustrator Kristi Bridgeman is published by Cherubim Books, an imprint of Ekstasis Editions and edited by Carol Sokoloff. 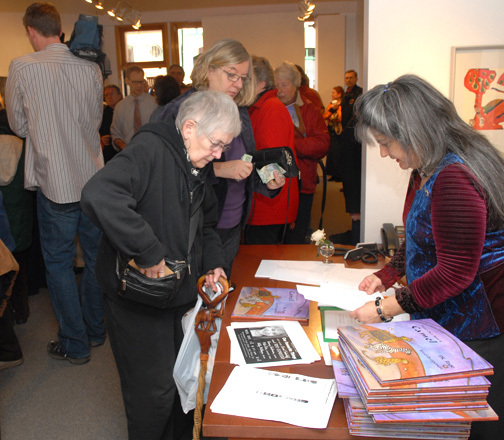 A large crowd jammed the Winchester Galleries for the launch of the book. Sadly, Ms. Page was unable to attend as she was not feeling well so it was left to illustrator Bridgeman and editor Sokoloff to tend to the visitors. Carol Sokoloff takes care of book orders in the crowded gallery. I have just finished reading “There once was a Camel” to my 5-year old grandson. Which book was recently given to me by a friend of Christi Bridgeman, and signed by Christi. I had no answer other than to say perhaps he wanted to take a look-see. Do you have an answer for Nathan? Could you address the answer to him at his mom’s email, theworths@shaw.ca ? thank you so much, you are a wonderful writer.